I’ve been called a fruitcake and I’ve been called a fruit — but not because I smell fruity. Men’s and unisex fragrances rarely feature a sustained stream of natural-smelling (non-citrus) fruit aromas, so my perfume cabinet has always had an empty space where I could lodge a FRUIT FRAGRANCE or two — but that situation may soon change. Last weekend, there was an unseasonably hot (over 75 degrees Fahrenheit!) day here in the Northwest and I stayed outside to feel the warm sun, to smell the saucer magnolias, wallflowers, hyacinths and clematis that are in bloom, and to enjoy the fragrant sea breeze blowing in from the west. The beautiful day made me think of the coming summer and I felt ‘summery’ myself; I reached for an untried perfume sample that sounded perfect for such a glorious day: Montale’s Fruits of the Musk. Fruits of the Musk contains bergamot, mandarin, raspberry, blackberry, strawberry leaves, Bulgarian rose and musk. Fruits of the Musk begins with the fragrances of ripe, sweet blackberries and tart raspberries. These fresh berry aromas quickly morph into the scents of sugar-dusted lollipops and, then, berry syrup (the type you combine with sparkling water to make “Italian” sodas). As far as the other fragrance notes are concerned, Fruits of the Musk’s mandarin, bergamot, strawberry leaf and rose notes are either imperceptible or not worth mentioning and its light “white” musk is present throughout the perfume’s development. I may not buy a bottle of Fruits of the Musk (50 ml Eau de Parfum, $95) but it made me yearn for a fruity/berry scent to fill that empty FRUIT FRAGRANCE space in my perfume cupboard. Any suggestions? 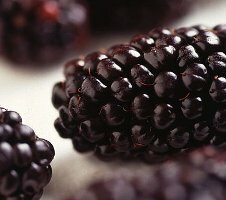 Image: Black Butte blackberry, photo by Scott Bauer via Wikimedia Commons. Kevin, I can only think of Montale Ginger Musk with ginger and red berries. But GM might also be too heavy and too sweet. Maybe there are not that many fragrances for men containing fruits? Maybe Serge Lutens has some..
Kevin, have you tried L'Artisan's Mure et Musc? It isn't sweet and just the right amount of musk and blackberries. There might be a little rose in it as well. I like the edt version but I hear the extreme is also nice. Marianne: I do want a light, FIZZY raspberry, blackberry, etc. Tart! Kelley: you know I wore that ages ago and these days it smells “warm and fuzzy” to me…not very crisp…and the last time I tried it I really got a vanillic vibe. The cologne version is to die for! I suppose you've tried CSP Mora Bella, their new incarnation of the old Fruits Sauvages? The new version is a little less vicious, but it still has some snap to it. It's worth a try, particularly since while reading your review of the new Montale, I was reminded of Mora Bella more than once. No lollipops in this one, though. Promise. And have you tried the latest Lacoste, Elegance? It's drenched with raspberries: not fizzy, but not sweet and cloying, either. R: I'll try them both…I like the idea of “drenched with raspberries” especially. cazaubon: have not smelled Falling in Love but will sniff it today. Montale is very sweet to me, but I like things on the dry side usually. ITA! The Cologne has a basil top note that never fails to make me feel all summer-y. I don't know if it would be your “thing” but Escada Sunset Heat for men comes across as very fruity to me. I'm no expert at picking out notes, but I feel a lot of big red berries. I also have a “FRUITY” vacancy on my shelf that was just partially filled by the arrival this week of my full bottle of Mure et Musc. I find it crisp enough because of the citrus in the top notes, and I don't get anything vanillic whatsoever. I can see how it gets sort of warm and fuzzy for you in the drydown though. This Montale sounds a little too sweet to be up my alley. I wouldn't mind trying Marc Jacob's pear splash (https://nstperfume.com/blog/_archives/2008/2/6/3508261.html), though it sounds like it might be more warm than crisp. I love pear aromas and would love to find a very crisp one. Higher Dior (not Higher Energy, a whole different scent) has a pear note you might like; it's dry rather than sweet. That isn't a major component of the scent, though, but it is definitely present. not a berry, but fruity and summery…l'artisan ananas fizz? Kevin, I live in the Puget Sound and the sun just put me into a summery fragrance mood. I was so excited that day that I went out without any SPF lotion and ended up red all over my face. But what glorious weather for the Northwest. Now I am on the hunt for the best summer scents! I love reading your posts! Thanks! you make the fruit sound… bearable (although i'm getting a shudder thinking of those evil little blackberries following me around and trying to drown me). beautiful review, although my skin amplifies sweetness to the max and could probably never wear this scent. i wonder if i might like it on someone else, however. the montales are hard to come by in canada, especially in this horrible little province called quebec, and so i doubt i will be able to test unless god granted me a giant favor and it started raining montales. kudos on the summer coming around, montreal is still a little nippy, bits of frozen stuff still on the ground (although we were lucky today and got nicer weather)… i wonder what i can wear in the summer with good lasting power (but no pestilent choke-age) that is not big on fruit. woods are a little dry for the summer and citrus/greens just fade too quickly (which is why l'eau de cartier, light blue and le chevrefeuille all got ditched after one bottle each), and flowers are well, flowers (i.e. boring unless conventionally thought of as weird or scary)… any suggestions? desperate need to bring some sunny optimism (exams period coupled with long winter) into my life, even if it's just in the form of a scent. PC: when I see/hear the word ESCADA my throat constricts…I've not had any luck with their line…but thanks for the suggestion nonetheless! Joe: pear is nice…but I too want it crisp…fresh plum would be nice (not too ornamented). I made a note somewhere about a new scent for men with a big slice of watermelon in it…I want to try that one too. Gina: forgot about that one…I do like it…and must pull out my sample. I'm determined to have a FRUIT scent for summer. Cadence: you're welcome and wasn't the next day a SLAP IN THE FACE..and snow forecast for the weekend! I guess it's back to waiting for JULY, right? HA! supa kawaii: I'm having a super sniff-a-thon this weekend so I'll try to sniff it. call it sacrilege but i have not sampled any of les jardins d'hermes! i do have a hermes boutique on my way home from my awfully long days in unairconditioned psychology classrooms, so i will perhaps reward myself after my awful exam tomorrow and do some sniffing. i always wonder if the large quantities of alcohol i consume have any effect on my brain functions… maybe it's the cause of my awful procrastination habit. Ironically, I've loved every fragrance they've made for men. haha. Have you tried Christian Tortu: Eau Fraiche Cologne Splash? Very hard to find, (here anyway) but a very crisp blend of citrus, blackcurrant, watermelon with ginger and basil. Thanks, pyramus, for the Dior tip — I've put Higher on my list. Yes, I came home to snow falling from the sky and then suddenly it's sunny! Talk about a tease! Kevin, I'll happily suggest Chypre Fruite for a good adult fruity Montale. For something much younger, lighthearted and frivolous (but I have a feeling this is just what you might be needing for such a spring day as you described) I would suggest Dew Musk from the Montale line. Chypre Fruite is peach/pineapple fruity, while Dew Musk is berry-fruity. PLATINUM: THAT sounds good…I'll start the search. lareinarumbera: If you sample any of them let me know what you think…. Burberry Weekend (for men) – crisp and fruity with a bit of watermelon and something kind of aquatic. Tommy Girl – I'm sure we all know about this one already. But Turin is right. It's so crisp and fruity it almost crunches. The Body Shop body spray in Pomegranate – red berry fruitiness. lovely. sarcon: thanks for the suggestions…I have tried all those and the “tart fruity itch” continues! HA! but for the moment I am found of “Eau de Charlotte” A. Goutal and the strange white flower/blackcurrant note. Ananas fizz is a 100% good choice also in my opinion.